Red Thai curry paste adds heat and depth of flavor to this simple soup. 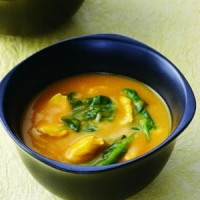 If you like, omit the chicken and spinach to make an even simpler first-course soup. Heat squash, coconut milk and water in a medium saucepan over medium-high heat. Cook, stirring occasionally, until the squash defrosts, about 10 minutes. Add chicken, reduce heat to medium and simmer, stirring occasionally, for 3 minutes. Stir in spinach, lime juice, sugar, curry paste to taste and salt and continue cooking until the chicken is cooked through, about 3 minutes longer. ***Variation: Substitute the chicken for spiced Thai firm tofu to keep it "veggie"! Like johnnysangel's recipes? Never miss an upload!